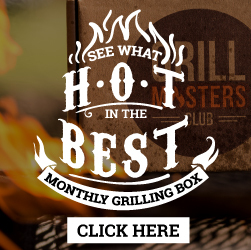 Imagine sitting in your backyard with your friends and family taking a bite from a delicious, scrumptious slightly char-grilled pizza baked in your very own wood-fired pizza oven. Everyone is having a wonderful time and is enjoying the unique atmosphere a partially open fire creates. 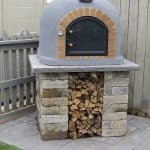 My guide to find the best outdoor wood-fired pizza ovens will not only show you the best outdoor wood-burning pizza ovens for your backyard or patio. It will also help you to decide which one of my recommended pizza ovens might be most suitable for your needs, wants, and budget. 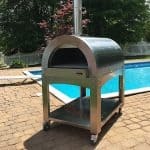 Purchasing an outdoor pizza oven isn’t something you will be doing very often, so it is essential to ask yourself a few questions before you make a decision. But before I get into more details, here is a comparison chart with my top choices at a glance. 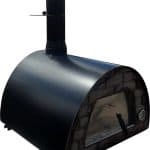 Brick Outdoor Pizza Oven PRC 1200 lbs no 90 min $$$ A traditional handmade Brick oven made in Portugal, well insulated and a stand out feature in any back yard. One year warranty. Il Fornino Pizza Oven Il Fornino 150 lbs (without cart) yes 20 min $$$ High quality stainless steel oven with a large cooking surface. Heats up quickly and comes with lots of accessories. Highly recommended! Pizza Party 70x70 Pizza Party 110 lbs yes less than 30 min $$ The Pizza Party is an affordable portable wood fired oven which can be used indoors as well as outdoors. Available in different colors. Maximus Pizza Oven My-Barbeque 150 lbs yes 30 min $$$ The Maximus is easy to use, heats up quickly and is made from high-quality materials. Recommended! Kamado Joe Grill Kamado Joe 200 lbs yes 15 min $$ The Kamado Joe is not your usual wood fired oven; it is a grill, BBQ, smoker and pizza oven all in one. Highly Recommended! Uuni 3 29.5 lbs yes 15 min $$ The Uuni 3 is one of the lightest portable wood-fired pizza oven. High quality, easy to use and great value for money. Recommended! Buying an outdoor wood-fired pizza oven is a significant investment with starting at around $1000 up to $2000. Of course, you could spend even more money, but I don’t think it is necessary. My top choices of wood-fired pizza ovens cost under $2000 and have all the features a great pizza oven should have. One of my recommended best outdoor pizza ovens for home retails only at around $300. So there are choices for wood-fired ovens available for any budget. The oven should be well insulated to retain the heat for many hours. The oven should reach a temperature of at least 800ºF. The materials should be of high quality, durable and should increase the longevity of the oven. An even cooking surface is vital for the perfect pie. 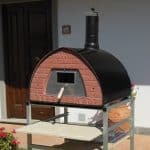 Before you make a decision which wood-burning pizza oven you would like to get, there are a few things you should consider. Do you want to get a portable or a standing pizza oven? If you decide on a static oven like the handmade brick oven from Portugal, then you will need to get a few things prepared. Firstly, where would you like the oven to be. It should be easily accessible so your family can enjoy it. If possible it should be in a sheltered area in your backyard but not too far away from the house. A solid, static oven will also add value to your property. If you choose on a portable oven, then the question to ask is if you want it on a stand/cart or are you going to build one. With a mobile oven, you are of course more flexible, and the location can be changed at any time. How important is the preheating time? A brick oven takes a long time to heat up to your desired temperature than the portable ovens as you can see in my comparison chart. On the other site, the brick oven retains the heat so much longer than the mobile ones. You could even cook your breakfast in the morning. Think of bacon, eggs, and sausages – yum! The size of the oven is a factor for a) how much space you have on your patio or backyard and b) what size pizza would you like to bake. 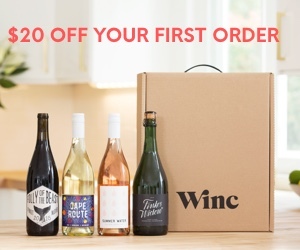 The price range of my top choices starts at around $300 up to $1800 max. That is a fair bit of money, but it is still in an affordable range. In addition to the ovens, you will also need a few accessories like heat resistant gloves, a pizza peel and a brush for cleaning. Read more in my post The Best Wood Fired Pizza Oven Tools. Even though most of these ovens come with an inbuilt temperature gauge, it’s an excellent idea to get a temperature gun as well. This beautiful pizza oven is a traditional and fully insulated wood-fired oven, made of terracotta clay. It has all the features we are looking for in a great pizza oven. It heats up to 1000ºF, retains the heat for many hours and will add value to your property. This brick oven will quickly become the centerpiece of your next family gatherings, tailgating, parties with friends and barbecues. The oven doesn’t come with a stand and weighs a massive 1200lbs. So you will need some machinery to lift it into your chosen spot. The base of the oven is 39.3″x 39.3″; the inside measures 31″x 31″. It is big enough to cook either 3 9″ or 2 12″ pizzas. Yum! The door is 15.7″ wide and 11″ high, so you can easily fit a pot inside the oven. The whole oven is about 30″ high, and the chimney measures 6″ in height. Overall, this traditional brick oven would make a fantastic addition to any backyard if you are opting for a standing pizza oven. For more detailed information, please read my in-depth review here. This stylish designed stainless steel portable pizza oven sure will be a delight for you and your hungry guests. In only 20 minutes the iL Fornino is hot enough to bake the first pizza. The cooking surface is large enough to cook three large pies or six small ones at the same time. That is fantastic for feeding a large crowd. This portable oven just sits on the cart that comes with it so you could also build your own pizza corner if you wanted to. But I think it is nice to have a portable pizza oven to be more flexible. But I think it is nice to have a portable pizza oven to be more flexible. A triple layer of insulation is responsible for the excellent heat retaining qualities in the iL Fornino. Along with this pizza oven, you’ll get an impressive set of useful accessories: a pizza peel, pizza oven brush, a scraper, and a heavy duty cover. Overall, the iL Fornino ticks all the boxes for a versatile, durable and high-quality portable outdoor pizza oven. For more details and information, please read my in-depth review here. The pizza oven Maximus is produced in Portugal and is an excellent example of a lightweight and portable wood-fired oven. You can easily put it in your truck and take it camping or for a picknick. The outer layer consist of Aluminum, the inner layer of stainless steel and the oven is insulated by a ceramic blanket between the layers. Unlike our brick oven also called Masonry oven, you can heat the Maximus up in less than 30 minutes. According to the manufacturer, you can cook 30 12″ pizzas in one hour! You can purchase a stand as an extra if you wish to. For more detailed information about the Maximus read my review here. Overall, the Maximus is a lightweight, portable and easy to use wood fired oven. It comes with accessories like a pizza peel, a metal divider to keep the wood away from the pizza and a terracotta cooking pan. Here is another lightweight, portable pizza oven, this time made in Italy. The Pizza Party 70×70 comes fully assembled delivered to your doorstep. You’ll only need to install the thick firebricks and the chimney, and then you are all ready to go. The door and the inner layer consist of stainless steel, and the outer layer is made from Aluminum – very similar to the Maximus. The big difference is the innovative rear flue; you can put the oven indoors and connect it quickly with an existing stove or chimney pipes. Take the Pizza Party 70×70 on your next camping trip – no problem at all. For more details, please read my detailed review. Overall, the Pizza Party 70×70 is a popular oven with great customer reviews.It is the most affordable out of my top choices. The Kamado Joe grill is not the typical wood-fired pizza oven. In fact, it is so much more than that. You can grill, slow cook, use it as a smoker and barbecue. 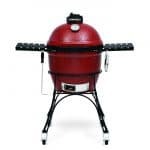 For more information about a Kamado style grill, please read my post What Is A Kamado Grill. Thanks to both a bottom and top vent, you can heat up the grill in 15 minutes, ready to bake the first pizza. The temperature goes as high as 750ºF. The inbuilt temperature gauge is precise and will tell you when the grill has reached the desired temperature. All it takes to bake the pizza in a Kamado style grill is a thick pizza stone and a heat diffuser plate which you’ll need to purchase separately. The Kamado Joe features a heavy ceramic body which is fantastic for heat retention and efficient burning of the lump charcoal. We do love the sturdy cast iron cart the Kamado Joe sits on plus the lockable wheels. It is a breeze to move this heavy cooker (188lbs) around wherever you need it. Cleaning the grill is easy with the convenient slide-out drawer to remove the ashes. Best of all, the Kamado Joe comes with a lifetime warranty on the ceramic parts which is a sign of the high-quality and durability of this grill/oven. For more details, please read my in-depth review. Overall, the Kamado Joe Classic is my top recommendation for Kamado style grills but also on my top list for outdoor wood fired pizza ovens. Great value for money! The Uuni 3 pizza oven is unique compared to our other top choices. It takes the word ‘lightweight’ no a new level of weighing only 29.5 lbs/13.4 kg. The chimney can quickly be taken off with the spring mechanism. That means you can takes this wood-fired oven literally anywhere with ease. Speaking of wood-fired: the Uuni 3 needs wood pellets to produce enough heat to bake a pizza in around 90 seconds. Even though the bottom is insulated, the Uuni 3 doesn’t retain heat well. The hopper needs to be filled with wood pellets every 5 to 10 minutes. This stylish wood-fired oven is big enough to make 13″ pies but also to put cast iron skillets in, to sear steaks or vegetables. Overall, the Uuni 3 is a great pizza oven for people who want to get started with making flavorsome, delicious pizza and are looking for an affordable wood-burning oven; they can take can anywhere. For more information about the Uuni 3 wood-fired pizza oven, please click here for my detailed review. A wood-fired oven is heat efficient, durable and needs only low maintenance which keeps the costs down in the long run. They are versatile from not only baking a pizza but also fantastic for grilling, roasting and slow cooking. A wood-fired oven is such an inviting centerpiece for family gatherings and celebrations where memories are made. A static oven like the masonry oven handmade in Portugal will also add value to your house. On the con site, it takes some time to learn how to heat up the pizza oven, how to cook the pizza without burning it and how you can use the oven most efficiently. Ultimately, it is up to you which pizza oven is best for you. It all boils down to your personal taste, the size of your backyard and of course, your budget. No matter which one you choose, your family will love you for it. Afterall, who doesn’t like an authentic wood-fired oven pizza? It is truly something special! Are you looking for an outdoor pizza oven that is powered by gas? Be sure to read our review about the Blackstone Outdoor Pizza Oven. Presto Pizzazz Rotating Pizza Oven – Is It Worth It? Great post, I haven’t heard about the Uuni 2S Wood Fired Oven. Must check it out. Right now I am using a portable compact pizza oven – Mr. Pizza GOT1509M Pizza Oven and Grill and I am looking to buy a new one actually a much bigger one. Hey Zac, it is actually the Uuni 3 which is an improved version of the Uuni 2S. Definitely worth checking it out especially with the low price tag compared to other outdoor wood-fired pizza ovens. Thanks for commenting and your feedback. Brick outdoor pizza oven is a traditional and fully insulated wood-fired oven, made with terracotta clay. It has all the features available which is present in top pizza oven. Overall, this traditional brick oven would make a fantastic addition to any backyard if you are opting for a standing pizza oven.